At Cypress Capital, we offer more than financial planning. What we provide for our clients, is a sense of security, confidence, and understanding of their holistic financial life. As CERTIFIED FINANCIAL PLANNER™ Professionals, who are goals-based, and legally obligated to put the needs of our clients, first. 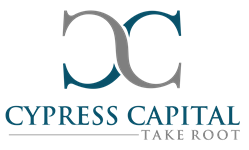 Serving all generations of individuals and business owners, Cypress Capital is dedicated to helping our clients make sense of every aspect of their financial life. As CFP® Professionals, we have answers. The kind of answers that won’t line our pockets, or pay for our next vacation. Beneficial responses that are meant to support you in your quest for financial independence. We will review your current situation, and help you understand at what stage of life you need to be thinking about the answers to these questions. Your business is your single biggest asset. The success of your business isn’t just important, it’s everything. At Cypress Capital, we understand this. We realize the time and financial investment you have made in your business and how essential the continued success of your business is. Not just to you and your family, but to every person you employ and their families. Group Insurance Plans- Please visit: www.cy-cap.com for more information. Our goals-based approach will consider your corporate assets and liabilities, and create a strategy that focuses on your future growth and returns.